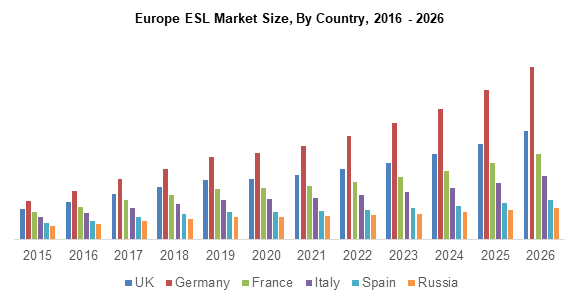 Europe Electronic Shelf Label (ESL) Market size exceeded $110 million in 2017 and is projected to grow at over CAGR of 13% from 2018 to 2024. The Europe electronic shelf label market is driven by adoption of consumer protection cooperation regulation by the European Commission. These regulations provide consumers protection against frauds and misleading product prices and information. The players in the retail industry in Europe are increasingly integrating advanced technologies to comply with the stringent government regulations, further aiding to the Europe electronic shelf label market growth. The regulatory norms consist of obligations for business owners to display the product prices on shelves for better customer experience. Germany and Austria are significant in the industry due to retail industry development and rising adoption of the technology in the retail outlets and restaurants. Full graphic e-paper ESL will fuel the Europe electronic shelf label market substantially over the future. These products are majorly manufactured in the region due to the development in the production processes such as inclusion of automated machines and robots to perform complex tasks. High demand of these products is attributed to the overall graphic capabilities for ESL display products. They can display product QR code, barcode, price, and product related specifications which is positively impacting the Europe electronic shell label market. IR technology in the Europe electronic shelf label market has witnessed high demand in the recent years owing to the ease product integration benefits. The bi-directional IR based products are deployed by major consumers due to the security and high-speed communication advantages associated with the technology. For instance, Pricer has launched ESL solutions for retailers incorporating the IR technology and provides automated price updates. Non-food retail stores are expected to dominate the Europe electronic shelf label market owing to the ease of product category management and cost effectiveness. The segment includes electronic stores, jeweler shops, footwear, books, and furniture stores that deploy these products for serving the customers in a better way. The utilization is majorly done by small and large multichain stores to provide product varieties to customers. Prominent players in the Europe electronic shelf label market include Pricer AB, E Ink Holding, Altierre Corporation, Wincor Nixdorf, SES-Imagotag, CEST, Solu M, and LG Innotek. Companies are focused on research & development activities to develop innovative products to cater to the varied customer requirements.